Bhubaneswar: The Khandagiri-Udaygiri Mahotsav was on Thursday kick started here. Khandagiri-Udaygiri Mahotsav will continue till January 28 this year at the Tourism Interpretation Centre at Khandagiri. The Kharavela Mahotsav, being one of the oldest event was replaced by the Kandagiri-Udyagiri Mahotsav this year. 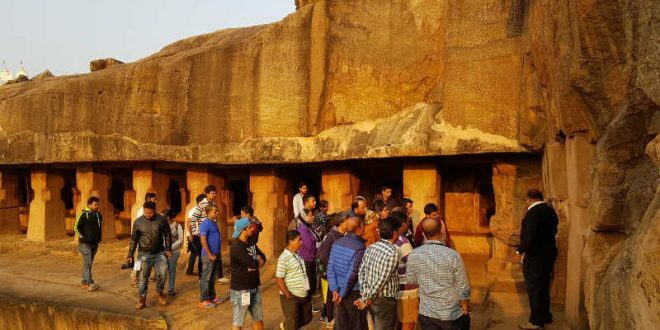 The sandstone caves at Udayagiri and Khandagiri bear testimony to India’s glorious past. Kharavela, during whose time these rock cuts were carved, was one of the best-known kings of Kalinga. The rock edicts declare the respect and the dedication of the king towards all religions and the love his people bore him. To promote the tourism in Odisha, the Mahostav is organised. The Mahostav was inaugurated by Chief Minister Naveen Patnaik. The other dignitaries like Tourism Minister Ashok Chandra Panda, MLAs from Bhubaneswar Priyadarshi Mishra, Bijaya Kumar Mohanty and Bhubaneswar Mayor Ananta Narayan Jena were present during the occasion. There was food festival, Pallishree (handicrafts) Mela, and exhibition of Boyanika, Odisha Maritime Buddhist by department of Odisha Tourism and Culture, State Museum By Archaeologist Department And ASI (Archaeological Survey Of India) . Padma Shri Sudarsan Pattnaik has created a beautiful sand art. There was Art and Craft exhibition, entertainment program along with the food festival where different types of food with that of snacks desserts and other items were available. The evening got more electrifying when Ranapa Dance from Ganjam performed Jodi Shanka while Odissi dance was performed by Odisha Dance Academy. Winner of Indian Idol Junior season 2, Ananya Sritam Nanda also performed during the occasion.